Bag yourself a couple of bananas! 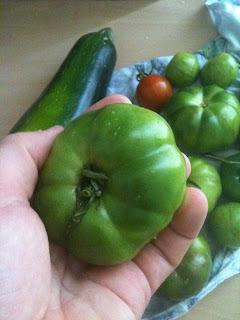 Good luck with getting green tomatoes to ripen off the plant: it doesn't work in my experience. Luckily green tomato chutney is the food of the gods... and there are plenty of recipes out there. Yes it's so sad that everything is slowing down now... I've been becoming a bit disillusioned with all of the dying plants on the windowsill. Are you planning on growing any winter veg in your allotment or not? My grandad has an allotment for many years now, and with unripe tomatoes, he either puts them in a draw lined with newspapers, or wraps them in a brown paper bag placed in a plastic bag. Nature has so much to give to us. All the plants are filled with all the nutrients required by the body to keep it healthy. Also some plants help to fight against disease. These veggies are so fresh and coloful. The banana method has worked in the past for me, but it's inconsistent! My Gran used to ripen her tomatoes on the windowsill. This seemed to work really well, providing there was a bit of sun. If not, that green chutney idea sounds good!